Price shown includes round-trip air & 5-day adult lift ticket. Option for 3-night pre-trip extension in Venice, departs U.S. March 5 ($445). 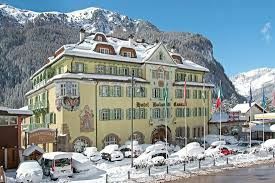 Blue Ridge Ski Council Eurofest with 7 nights (Sat-Sat) in the historic 4-star Schloss Hotel Dolomiti (tel. 011-39-0462-601106). Our trip includes a welcome reception, mid-week Apres-Ski Party, Farewell Dinner/Dance Party, and a "Trentino Ski Sunrise Surprise Breakfast." Located in the Dolomites, Val di Fassa lies in the north-east part of Trentino in Northern Italy. It is surrounded by the most spectacular and famous Dolomite peaks, which ice and wind have modeled into the steep walls, towering spires and daring pinnacles typical of these mountains. The attractions are further enhanced at sunset when the sun’s rays set the rocks alight and turn them to a warm red color. The valley is also famous for the Dolomiti Super-ski region and the 10 villages that make up the charm of the Ladin culture, cuisine and language. Canazei is the only major resort in the Fassa Valley truly located on the Sella Ronda circuit with access to Corvara, Colfosco and Arabba. Canazei is known as the “jewel of the Dolomites Superski area” and is the capital of snow sports. 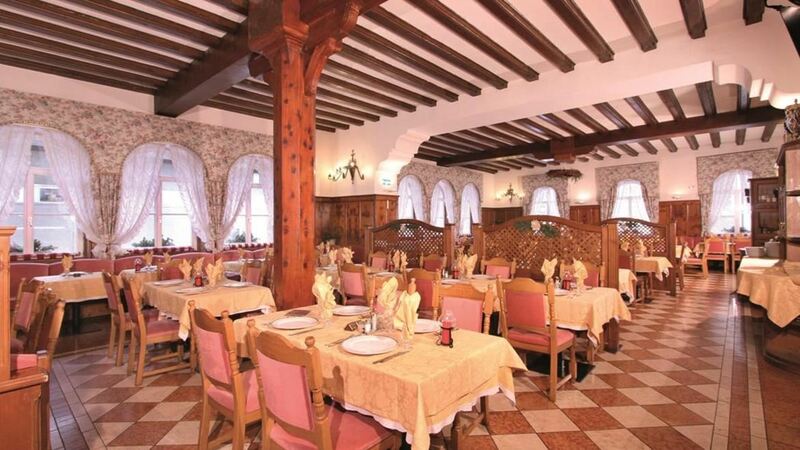 It also hosts our historic Hapsburg period-style hotel. With just under 2000 inhabitants, the Village of Canazei is in the Ladin-speaking part of the Dolomites area of Italy. It is one of the main winter centers in the Val di Fassa (Fassatal for the German-speaking part of the South Tyrol) and occupies a strategic position in the Sella Ronda. Canazei is often mentioned along with the neighboring Village of Campitello, which has its own connection into the vast Sella Ronda area with a lift from the resort heading up near the Sella pass. Schloss Hotel Dolomiti is strategically located in the heart of Canazei in the upper Fassa Valley near the park and the new Aquatic Centre Dolaondes. A historic and impressive family-run hotel, built in typical Hapsburg period style, it's at the foot of the famous Rosengarten mountain range, recognized by UNESCO as a natural heritage. 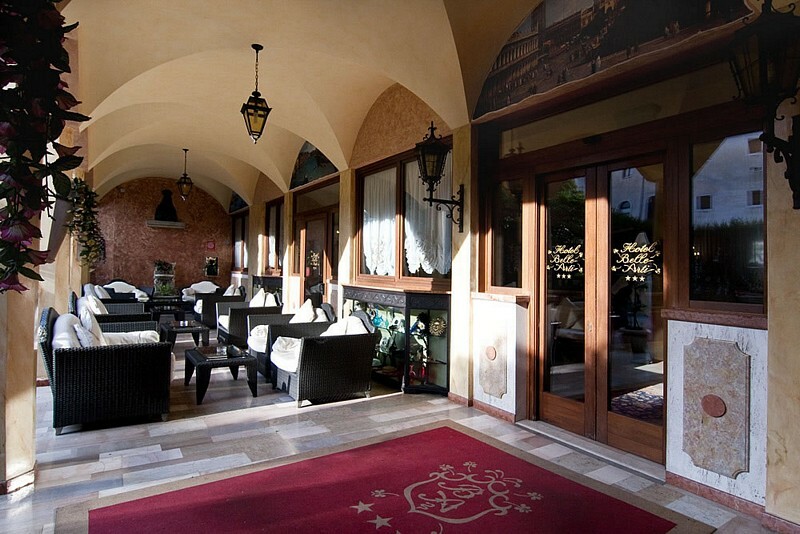 Situated in a picturesque and charming environment, the hotel is full of history and poetry, with wood paneling, vaulted ceilings, refined furnishing and a traditional welcome, in keeping with the hospitality that Trentino is renowned for. The Belvedere cable car is a short walk from the hotel, which is an excellent starting point for magnificent walks in the unspoiled beauty of the Fassa Valley. The restaurant pizzeria cafè, bar pub Kaiserstube, with the “Kaiserin Sissi” reserved dining room, is connected to the hotel. Half Board (Breakfast & Dinner) is included, featuring an International buffet breakfast, sweet and salad buffet, a wide choice of themed dinners, and candlelight salad buffet. Amenities include satellite TV, minibar, telephone, safe, and hairdryer. The listed price is for double occupancy in a Classic Double Room, and includes a 5-day adult lift ticket (unusual for European trips!) and round-trip air from Dulles (details below). Emergency medical, evacuation & repatriation insurance (not cancellation insurance) is included. Note that this is not cancellation coverage and will not provide any relief if you have to cancel from the trip before it begins, whether for medical or other reasons. You may upgrade your coverage to include cancellation coverage by clicking on the link. It will take you to a flyer describing the options available, including a link to the detailed coverage plan. Note that the "Cancel for Any Reason" (CFAR) option must be purchased within 14 days of paying your initial deposit on the trip. Our inventory of single rooms is extremely limited; contact trip leader to confirm availability. Three nights (Wed, Thur, Fri) in the 3-star Hotel Belle Arti in Venice, with daily breakfast. This quaint hotel is perfectly located in Venice’s Dorsoduro district, opposite to the Accademia Belle Arte from which it takes its name. It’s between the Zattere and the Grand Canal -- off the beaten track but near the Peggy Guggenheim Museum and only minutes from the enchanting Piazza San Marco. Wednesday morning after arriving at the Venice airport on our overnight flight from Dulles (and a connection in London -- details below), we'll ride a private water taxi to our hotel. Saturday morning we'll hop back on water taxis and then ride a bus to Val di Fassa where we'll meet up with the main group for skiing. Our return home on Saturday, March 16, is then back from Venice through London. Note: British Airways partners with American Airlines under the OneWorld Alliance for accruing frequent flier miles. We will provide our tour operator with your American Advantage number if you have included it in your profile. Note: Lufthansa and Austrian Airlines partner with United Airlines under the Star Alliance for accruing frequent flier miles. We will provide our tour operator with your United Mileage Plus number if you have included it in your profile. Membership Requirement: Your club membership must be current when signing up for the trip and throughout the duration of the trip. The trip has been "sanctioned" through the Blue Ridge Ski Council. Current members of other BRSC member ski clubs may register for the trip.